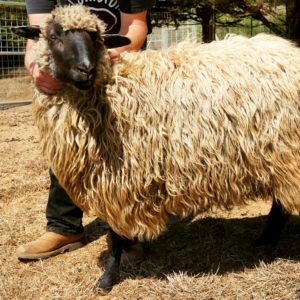 The wool of the Navajo-Churro sheep was our first experience working with animal fiber. As a farmer there is no better education about your animals than shearing day, followed by hours of meticulously picking and cleaning fleeces. Navajo-Churro fleeces are thick and strong, with locks that look like lusciously highlighted 6-12 inch hair. The under coat (soft) and outer coat (coarse) are clearly defined. Fibers come in a range of neutral colors, are moderately soft to very coarse, have an amazing luster, and lend themselves to a variety of fiber arts including spinning, felting, knitting, and weaving. Weaving is the most important historic use of Navajo-Churro wool. Softer yarns are used for blankets and throws. Coarser yarns make excellent tapestries and sturdy rugs. 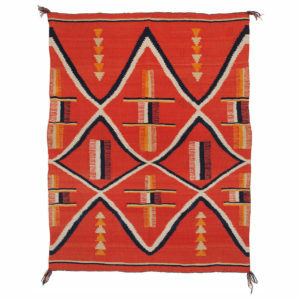 Depicted below is a Late Classic Period Navajo Child’s Wearing Blanket, circa 1875. This piece was meticulously woven from the softest lambs’ wool, spun to a fine lace weight. The finished blanket is perfectly reversible. We believe it is very important to breed for rams and ewes with high-quality fleeces. 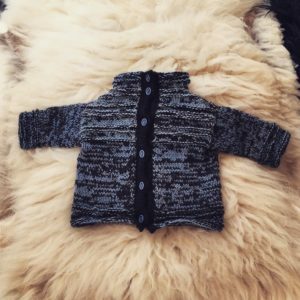 Validating this effort requires working closely with your own fleeces (skirting, washing, and spinning), collaborating with your wool mill, and asking buyers for feedback. We enjoy connecting with artists and supplying them with beautiful wool and yarn. Our goal is to hear our customers say “WOW!” It is truly an amazing feeling to see the animal fiber you helped create come to life in the hands of talented customers. 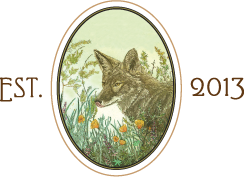 We are a Certified Producer for the Northern California Fibershed, an organization devoted to bringing fiber producers and textile artists together within a vibrant local network. We are also members of the California Wool Growers Association.